Water testing helps assure proper sanitation and bather comfort. Proper Water Testing Is The Key To Balanced Water. Scroll down to browse through some archived Spa and Hot Tub questions and answers. Please click the Spa Problems Link, on top of every page, to access a complete listing of Spa Problem subjects, an alphabetized Website Table of Contents, Spa Equipment Information, About Alan Biographic Material and a Pool and Spa Glossary. Use the other links to access additional subject information. More information about some new and unique products, for pools and spas, can be found by visiting The Website Store. You'll never know what you'll find and that's always fun. Be better prepared and avoid costly problems! Testing Spa, Swim Spa and Hot Tub Water Chemistry!!! Some tests, such as Nitrates, Phosphates, Manganese, Copper, Iron and others, are not included, in many popular testers and require a Specialty Test Kit. Using fresh Test Kit Replacements help assure better accuracy and reliability. 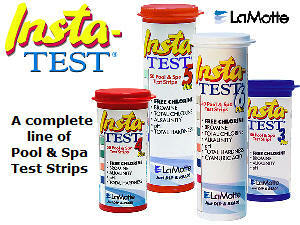 Insta-Test Strips can perform a wide variety of pool and spa tests. How to properly and reliably test spa water? Proper water management starts with the analysis and balancing of the spa or hot tub water. Tests such as pH and sanitizer need to be performed by the spa owner, on a frequent or daily basis, depending upon the sanitizer choice and usage conditions. If Chlorine is used, it should be tested by a method that measures Free Chlorine, as it is the most important. Tests such as total alkalinity and calcium hardness are performed occasionally and can be done by a spa owner or dealer. Tests for heavy metals such as iron, manganese or copper should be performed at the initial filling or at the first indications of spa water discoloration or a spa surfaces staining problem. These tests are usually performed by a spa professional. Maintaining or balancing proper spa or hot tub water chemistry is important to help assure optimum water quality and to maximize the "hot water" experience. 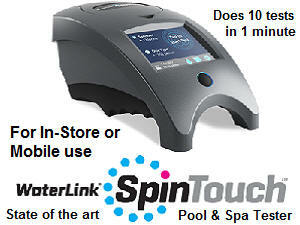 For most spa users an all-digital ColorQ Tester is all they need, to take control of the water chemistry. If problems arise, refer to the Spa Problems Page, as a source of problem-solving information, broken down into various categories. Scroll down the page and click on the linked keywords, catch phrases or images, in the archived answers below, to access additional information, on that topic or product. Fresh testing reagents are important, to help assure reliable results. Most reagents have expiration dates. We sell replacement reagents and supplies, for every LaMotte Pool and Spa Tester, for homeowner, professional or facility use. If you have any model of ColorQ Tester, WaterLink SPIN LAB, WaterLink Express Lab, Tracer PockeTester, LaMotte Specialty Test Kit and more, we have factory-fresh replacement reagents and supplies. 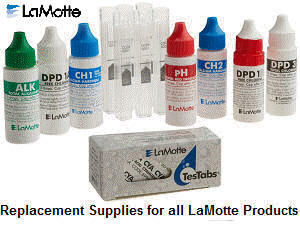 Simply use this link, LaMotte Test Kit Replacement Reagents and Supplies, and scroll down the page, until you see the tester, that you are looking for. If you are looking to purchase a new tester, use this link, Water Testing Supplies, to find the product, that best suits your needs. If you are unsure or undecided, please feel free to contact us. We are a factory-authorized seller, that understands water testing, and specializes in Pool and Spa Testers. ► Water Testing With A Salt Chlorine Generator? I just added a salt chlorine generator and want to be certain, that I get the right testing information. I would like to use the #2056 ColorQ PRO 7 photometer kit. It seems to be just what I was looking for. Can I to use a ColorQ in a saltwater spa? Can I benefit from a separate salt tester? Thank you for the information. The ColorQ Water Analyzers are ideally suited, for use with salt chlorine generators. It will perform all of the important tests, with the exception of the salt level. Salt levels need to be maintained within the range, suggested by the equipment's manufacturer. Proper salt levels help assure proper performance and extends the life of the salt cell. A digital salt tester is the best and easiest way to monitor the salt level, as it changes over time. We offer several models of all-digital electronic salt testers. I hope that this information will be helpful. ► ORP Testing And A Salt Chlorine Generator? I recently bought a new hot tub. Have had it set up for about 2 1/2 weeks now. It has a salt chlorine generator. It's 450 gallons. I have a 6-in-1 digital tester. My 1st set of readings have me puzzled. My salt is suppose to be 2600-3900. My question is why is TDS so high? How do I fix this? I don't know what ORP is suppose to be. My water is clear. Any suggestions or help appreciated. Thanks in advance. The ORP of a swimming pool should be between 650 mV and 750 mV. It measures the true state of chlorine activity. The ORP varies inversely with pH level. When the pH increases, the ORP decreases. When the pH decreases. the ORP will increase. The ORP reading should be measured, when the pH is within the 7.2-7.8 range. A low ORP means more chlorine has to be added. A high ORP reading means that there is excessive amounts of chlorine. Your 6-in-1 tester does not directly measure chlorine, but uses ORP to determine if the chlorine level is low, ideal or high. Your salt chlorine generator will raise the pH, as chlorine is produced. Acid needs to be added, on a regular basis. Try and keep the pH at 7.2-7.8. TDS is always higher than the salt level, as it measures the sum total of all dissolved material. The water, used to fill the spa, should be tested, as a point of reference. The TDS is higher than one would expect, but that is probably due to the source water, in large part. Replacement with softer water is the only way to lower the TDS and get it closer to the salt level. Nothing in the test results points to a problem. I hope that the information provided was helpful. ► Bromine Tester For The Color Vision Impaired? I was wondering which digital tester you recommend to a person who is pretty much color blind. I have a 4 year old spa Twilight and I use bromine sanitizing chemicals. I can no longer read test strips and it’s becoming a problem. Thank you. The ColorQ testers will eliminate the color matching and guesswork, as they are all digital. I would suggest either the #2056 ColorQ PRO 7 or the #2072 ColorQ PRO 6. They do the same tests and the only difference is that the #2072, uses a tablet, for the calcium test, as opposed to liquid reagents. Calcium is not a test that is run frequently and the liquid calcium reagents have a shorter shelf life. For this reason, I suggest the #2072 ColorQ PRO 6, which uses calcium hardness tablets, with a 2-3 year shelf life. This is more in line with the chemicals, for the other tests. The prices, for both testers, are the same. I hope that this will help with the decision making. ► Choosing A Bromine Test Kit? My hot tub is on the 2-part bromine system. What is the best way to test for bromine. Can I use a swimming pool test kit? I see a lot more of the test strips around these days. I've never used them. Are they reliable? Thanks for any help you can offer. I would not suggest that you use a swimming pool test kit, unless it is specifically made to test for bromine! Bromine can interfere with the pH test and give a false high test result, if the pH test materials are not formulated properly. Test strips have come a long way in terms of reliability, accuracy and the number of different tests that can be performed. The majority of test strips can test for chlorine and bromine and the convenience and lack of liquid chemicals makes them a choice of growing popularity. If you would prefer to eliminate all of the color-matching, an all-digital ColorQ Water Analyzer would be an excellent. Browsing through the archives on this topic might be a good idea. Glad to help. ► How Often To Test Spa Water? Everything that I read seems to give a different answer to the question of how often spa water should be tested. What's your take? There is a lot of subjectivity on this topic. My feeling is that it is better to test more often than less often! I suggest that the sanitizer level and pH be tested prior to each use of the spa. If the sanitizer level is too low, it should be adjusted and at least 1/2 hour should be allowed to pass before the spa is used. In addition, I would test the spa after each use. This will allow the sanitizer to be replenished on an as needed basis, decreasing the possibility of bacterial growth between uses of the spa. If the spa is only used occasionally, it should be tested at least weekly, just to make sure that the sanitizer level is being adequately maintained. The proper balancing of spa or hot tub water will, in the long run, avoid many problems. For your own testing, a ColorQ all-digital water tester would be an excellent choice, doing all of the common tests At least occasionally, to better assure proper overall spa water chemistry, visit a pool or spa store that has a very reliable, professional lab such as a WaterLink SpinTouch Lab, rather than a less accurate test kit or strip reader. I hope that I have shed some light on the subject. Enjoy the spa. ► Proper Sampling For Test Strips? How is it best to sample the water, when using test strips? While is good practice to test the water before using the spa and afterwards, how the water is sampled is important. Follow the manufacturer's instructions! Always shut off the pump and never immerse the test strip in front of a moving jet. To do so might wash the chemicals out of the test strip and give false readings. The new LaMotte strips are simply dip and read, It's that quick. I hope that I have been of help. ► Which Test Strips To Choose? I have been using test strips ever since I got the hot tub about 2 years ago. They seem to do a pretty reliable job. I have been using bromine, with an Ozonator. I have seen another brand of strips that are much less expensive. Are they as good? Thank you. I don't want to say that the other strips don't work because I don't know anything about them. But this I do know! Test strips are not simply chemicals on paper. Test strips, for spas, hot tubs and pools, grew out of the medical testing industry: where they were developed to run certain blood and urine tests. Some pretty sophisticated technology is involved - even in test strips for this industry - in order to produce testing materials that can provide accuracy, reliability and have a reasonably long shelf life. Not all of the strips out there meet this standard. Sometimes, even a thing as simple as how they are packaged can make a big difference. Test strips must be protected against moisture, in order to maintain their reliability and shelf life. While all test strips may have a drying aid inside to help absorb moisture, the LaMotte Insta-Test Strips have included a more effective, moisture-absorbing, desiccant liner in the package, for added reliability and shelf-life. Because so much depends on the accuracy and reliability of the test results, I would stick with the brand that has gained your confidence and satisfaction. When using test strips always remove the strips with dry hands and reseal promptly. Keep the unused strips away from heat, moisture and light. I hope that I have been helpful. Please browse through the archives on this and related topics. Enjoy the hot water experience. I would love to be able to test my spa water, but I am color blind. I have to keep after my wife to read the test strips. We have an ozonator and the dealer suggested that we maintain a 1-2 PPM chlorine level. I can't read the chlorine or pH colors, so is there any other way to test the water? Help has arrived. The ColorQ Labs are a group of hand-held, photometers, that you can use to test for Free and Total Chlorine, Bromine, pH, Alkalinity, calcium Hardness and Cyanuric Acid. Some models test for biguanide, biguanide shock, copper and iron, as well as some or all of the other tests. One will be right for you. It is done simply, quickly and without having to look at any colors or look up charts. Just read the answers on the LCD Display. The price is reasonable and it will put you in complete control. The proper testing of spa water helps to make the hot water experience a more pleasurable one, by helping to improve water quality and sanitation. I hope that it works out for you and that the website was helpful. ► UV, Ozone And Water Testing? I ordered 3 of the LaMotte ColorQ PRO 7 digital meters, from your website, a while back. Don't know if the results would approach laboratory standards, but it's far more accurate than the old eye interpretation. LaMotte has outdone themselves. And it's so easy to use! The 2 biggest problems I see are it may be better in a water tight (or close to) case, but mainly more people need to know about it. Do you spend much time marketing these things? I think they would sell well, if more folks knew about them. But, the real question. Still playing with well water. Going to add Chlorine by injection. Had bought and was going to install an ultra-violet light. Don't need it now. Has anyone reported on its use or is it just a plain stupid idea to put it in my hot tub? I sure can't notice a difference with the hot tub ozonator. In your spa book, you mention filling the spa with softened water. I couldn't agree more. And with the help of the LaMotte ColorQ, I now know how much calcium to add. Thanks for the books and meters. Thanks for the purchases and your comments. Sales of the ColorQ Water Analyzers, and the new additions to the line, are going well. My website reaches a considerable number of people, but there are lots more out there. With a reasonable price and the capability to perform up to 11 different pool or spa water tests, I think the handy case does what is required: organizes and keeps everything in its proper place. Word of mouth seems to play a big factor, as I am on so many favorites lists, according to many of the writers. Ultraviolet UV sanitizers make a lot of sense, especially, if you understand their limitations. While it kills virtually everything, in the return flow, including some of the worst microorganisms, it cannot be used alone. You need oxidation, such as chlorine, bromine or an ozone generator. Even if you add an ozone generator, you might not kill all the microorganisms on the underwater surfaces. That is where chlorine and bromine come into play. If your ozonator is working properly and is used for enough time, it will reduce the required amount of, chlorine or bromine, to a fraction of what it would be, otherwise. With the proper use of UV and ozone, almost any measurable level of free chlorine will suffice. The system is redundant and should not be subject to rapid bacterial growth. The problems begin, when people try and eliminate all of the chlorine or bromine. Minimizing should be the goal. You could add a salt chlorine generator, which is a simply better way to do chlorine. We offer several models, that require no installation and 2 of them are smart enough, to only produce chlorine when it is actually needed. 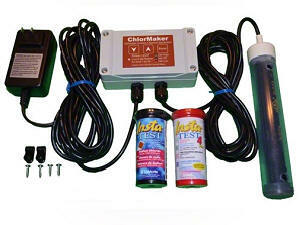 You'll never over-chlorinate again, with these smart salt chlorine generators. And you have the ColorQ to do the testing. While an analytical laboratory could produce more precise answers, it would be overkill. The ColorQ provides all the accuracy a pool or spa test requires, while maintaining simplicity and ease of operation. I hope this information is helpful. ► Can Lighting Affect Readings? The spa water test readings, seem quite different, viewed in the spa area (Commercial Spa), with the sodium vapor lights. When I go into an area with regular lighting, the colors seem different. Is it because of the color of the light? Thanks. The color of the light could be the problem. Test strips and comparator colors can be influenced by lighting and sodium vapor lights are probably the most troublesome. Any colored or dim lighting can be a factor. It is best to read under bright natural light or white lights. One way to avoid all of these problems is with the LaMotte ColorQ Water Analyzers. There are several models and one would be right for your situation. I hope that this will help provide more consistency and help solve the testing difficulties. ► A ColorQ Digital Analyzer or a Test Strip Reader? I am not good at matching colors and I like the idea of the digital ColorQ water Analyzer. I saw a test strip reader and that seems quite easy to use. How would you compare them? Thanks in advance, for your valued opinion. Photometers, such as the ColorQ Digital Water Analyzers are capable of better reproducibility and accuracy than any test strip. A quality test strip, such as the LaMotte Insta-Test products, are able to provide test results that are reasonably and suitably accurate. The problem comes about in trying to match the colors to the color swatches. Using a strip reader does not impart greater accuracy and actually adds a few more variables. How long did you wait, before inserting the strip in the reader? How wet was the strip? Did water run, from one test pad to the another? What was the temperature? All of these variables, and more, affect the test results. An instrument, such as the ColorQ, is based on the same technology used in laboratory instruments and has a long history of successful use. Test strip readers may be convenient and fast, but are not capable of matching the performance of a quality photometer based tester. The feedback about the ColorQ line of testers has been highly favorable. The same cannot be said about dealer/consumer experience with test strip readers. I hope that this information will help you make the right choice. I have been using dichlor in my hot tub and have been using test strips. They seem to be labeled for pools or spa and chlorine or bromine. Is there a problem using this product? Thank you. Because you are using chlorine, it is important to test for Free Chlorine: the active sanitizing form of chlorine. This is more important than Total Chlorine. So long as the Test Strips measure Free Chlorine, I don't see a problem. I would not recommend that you use an OTO test kit. Try and keep the Free Chlorine at 1-3 PPM. The Total Chlorine reading should be no more than 1-2 PPM higher, at most. If the Total Chlorine is much higher, you might have to shock: a non-chlorine shock should be effective at converting the combined chlorine into Free Chlorine. Don't forget to test for the pH on a daily basis and the TA and calcium hardness on a regular basis. This will help keep the spa water chemistry in balance and help maintain proper water quality and clarity. Enjoy the hot tub. ► Chlorine Test Turning Orange? My hot tub holds 300 gallons and the water has only been used 2 times since it was changed. The temperature right now is 102 degrees. My chemical test kit is giving me a reading of 7.5-7.6 pH and Alkalinity in the normal range. However, my chlorine test result is a dark, burnt orange. I have had the hot tub for 2 years and never encountered this before. What is the problem? Too much chlorine? What do I need to do to correct? Do I have to change the water again? The chlorine in my floater seems to be dissolving faster than ever. Please advise. Thank you so much. This sounds like you are using an OTO test kit and that the chlorine level is very high. I suggest that you mix 4 parts of tap water with one part spa water and test immediately. Multiply the answer by 5. A better way to test water would be with the ColorQ all-digital water analyzers, as they perform best with high chlorine. up to 10 PPM. Scale back on the amount of chlorine being added, as chlorine tablets are really not suitable for spa use, as the high temperature causes them to dissolve too quickly. You might replace some water to lower the chlorine level, if water has not been replaced recently. Otherwise, there is a chlorine neutralizing chemical that you can add. The addition of a salt chlorine generator is something that you should consider, as it will make maintenance easier and produce high quality water. It is the better way to do chlorine, providing more control and better results. I hope that this information is helpful. Excellent website, very informative for the "chemistry challenged" people like myself. Hoping you can help? We just purchased our spa within the last month and were given starter chemicals: dichlor, shock, test strips, pH buffer. These are the only chemicals we are using. The original test strips tested for Chlorine, Total alkalinity and pH. When I ran out, I purchased a different brand of test strips that also happened to test for bromine besides chlorine. Now these test strips are testing positive for both Chlorine and Bromine, although we don't even own any Bromine chemicals. I went to have water tested where we purchased the spa and received the same results. They too were puzzled saying that it shouldn't show positive for Bromine but didn't seem concerned. Any suggestions? Also while there, they said that our pH was too low and that we needed to add more chlorine which I did yesterday. All readings are now very high. I am showing 5 for Bromine, 5 for Chlorine, 180 for TA and 8.4 for pH. Should I be concerned or will the pH lower itself? Thanks. The test methods for chlorine and bromine are, basically, the same. It is the color comparison charts that are different. You did not add bromine and, therefore, you should ignore the bromine reading. There is nothing to be concerned about, just maintain a free chlorine level of 1-3 PPM. The pH of 8.4 is too high and should be lowered. A high pH will reduce the effectiveness of chlorine and could prove irritating to bathers. A pH of 7.2-7.6 is recommended for chlorine maintained spas. You should consider upgrading to one of the new ColorQ all-digital water analyzers, which eliminate all the color-matching and guesswork. Voted product of the year! Enjoy the spa. I received my LaMotte # 2058 ColorQ Pro 11 test kit last week and like it very much. However, I would like to confirm with you how I should consider results that may disagree with my local retailers. Acknowledging that even using proper protocols there are bound to be variances in results by different test kits, tests done at different times, etc., I guess I would like to know if LaMotte calibrates the instrument before shipping and whether a properly stored instrument and reagents should give more reliable results than our local vendors over time. My sense is that the answer is yes to both questions, but I need to confirm because of the results I received yesterday from carefully controlled water samples. A recent trade article found that the dealer testing of calcium hardness was the parameter subject to the greatest errors. This was especially true of the simple drop count testers and test strips. Photometers, of which the ColorQ water analyzers are examples, were found to be of the highest accuracy. Adding a test strip reader, in my opinion, can further decrease accuracy and reproducibility. There are things that you can do to both increase reliability and reproducibility. Make sure the dropper bottles are held vertical and that distinct drops are formed. In addition, the plastic test tubes should be clean, dry on the outside and free of scratches. The ColorQ Blank procedure analyzes the LED output when the little flashing bar is going across the screen. For best results make sure the tubes used for all the tests have comparable clarity to those used for the blank, since that is the self calibration step. Special color dyes are used to check the calibrations before shipping. The algorithms are locked in and, if the dyes meet the test protocols, the instrument goes to final assembly and is released. Some dealers use professional testers, such as the LaMotte WaterLink SpinTouch Lab, which provides the best test efficacy, when used properly. Reliable testing will save on chemicals and help avoid problems. I hope that this information will be helpful. Thanks Alan. That is exactly what I hoped and believed would be the case. I have every confidence that the ColorQ Pro is providing the most accurate test I can get and the check against the retailers' tests reinforces my belief. The instrument is a solid investment. ► Are The Devices Working? Great site for info. We have recently purchased a hot tub and tried chlorine, then bromine with little success. The hot tub has an ozonator and we bought a mineralizer to use in conjunction with ozonator, hoping to reduce greatly or eliminate chemicals like chlorine & bromine. Problem we have, is knowing whether the devices are working, as the test strips are for the chemicals. Would appreciate any info on ways to test the devices or water to be sure THEY ARE WORKING. I should add that we drained, cleaned and refilled tub when we installed purifier and now back to chlorine daily & non-chlorine shock weekly. Thank you very much for any help. Sounds like you have tried everything. The problem is that you that didn't mention if you actually had problems. You should be able to get ideal water quality, by using the ozonator and maintaining a 1-3 PPM level of bromine. There should be little chemical presence. Make sure th at the ozonator is operated for at least 4-2 hour periods, spread throughout the day. This will provide the necessary oxidation of waste products and make it easier to maintain the bromine level with fewer chemicals. There's no problem testing for bromine: test strips are fine. The ability to maintain a satisfactory level with a minimum use of bromine can be taken as confirmation that the ozonation is proper. When the cover is removed, you might be able to smell ozone: the scent of crashing waves? For information click here. You should not require chlorine or a mineral sanitizer. MPS should only be added, if there is a loss of water quality or after periods of heavy bather usage. Adding a small amount of MPS, after each use, will help restore the bromine level. It just seems a matter of putting some trust in the test results and your own observations. The water should be clear and there should not be any slimy film on the underwater surfaces, as these are signs that sanitation might be inadequate. You might consider switching to one of the ColorQ all-digital water analyzers, which eliminate all the color-matching and guesswork. You'll find them easy to use and these is a model, for every need. I hope that this information helps to put your mind at ease. Enjoy the spa. ► Bromine Or Chlorine Test Results? Hi Alan. My spa chemicals came with test strips. The readings are Bromine levels, Free Chlorine levels, pH, and TA. In a Bromine sanitized spa, is there supposed to be free chlorine? If so, my other readings are all good, but there's never any free chlorine. What should I do? Thanks. The same test strips are used to test for either chlorine or bromine. In a bromine-maintained spa there is no chlorine present - it's all bromine. You should disregard the chlorine readings, as they are meaningless, in your case. Enjoy the spa! ► Difficulty Testing pH In A Biguanide Spa? The strips are convenient, but some are not as good as other test methods, when used in a biguanide-maintained spa. The more traditional testing materials, used prior to the test strips, seemed to provide good results and are probably still being used by the dealers. For a better testing option consider using the ColorQ Biguanide PRO 5 Water Analyzer. It is all-digital, requires no color matching or look-up charts and it's affordably priced. In addition to testing for biguanide, it performs the pH. total alkalinity, calcium hardness and Biguanide Shock tests. It is the perfect tester, for those with any color vision impairment. I hope that this information will prove helpful. I think that I goofed. I was actually in my spa, when I reached over and grabbed the test strips. I may have gotten a drop or two of water on the strips. Can this cause a problem? It is a real probability. The test strips are usually packaged with a drying aid inside. This is done to help protect against the deteriorating effects of moisture. Always remove test strips with dry fingers, reseal the container and store away from light, moisture and heat. There is no way for me to determine, if the strips are still reliable. Most test strips have expiration dates and are packaged in quantities that make regular replacement routine, if the spa water is being tested on an appropriately frequent basis. To be safe, replace all testing materials at least yearly or whenever something appears different. I hope that I have been of assistance. ► Spa Chlorine Test Kit? My spa came with a test kit that uses 2 liquids for the pH and chlorine test. What is the best test kit to use with my spa? I am running out and need to but replacements. It is 275 gallons and I use sodium dichlor. Thanks. If the test kit that you are using contains OTO for the chlorine test, it is not one that I would recommend. It is important that you test for Free Chlorine and OTO cannot do that. I suggest that you use a ColorQ all-digital tester, which performs all of the common spa tests, including free and total chlorine. I hope that I have been helpful. Please browse through the archives for more on this and related topics. Enjoy the spa. I have realized that my key challenge with my spa is pH. Unfortunately, the traditional test strips are difficult for me to read. Are the pH testers in your store really more accurate? What else would I need to order in addition to the tester itself? Some people do seem to have color perception problems and for them an electronic tester is just what is needed. The LaMotte ColorQ Water Analyzers test for pH, free and total chlorine, total alkalinity calcium hardness and cyanuric acid. These kits includes everything and there are no colors to match and no look up charts! The test results come right up on the digital display. The instrument is hand-held and perfect for spa or pool side use. Accuracy is better than most other test methods. I hope that this information proves helpful. Thanks for your quick reply. I think you may have misunderstood me in my question just a little. I already added the baking soda to raise total alkalinity and pH, as my pH was reading 7 according to the strip I was using. This strip was called pHydrion Vivid 6-8. They weren't meant for hot tubs, but figured they should read the same. I understood most of what you suggested but was wondering if my readings were artificially high being that I took my water sample to the spa store only 20 minutes after adding the baking soda? Is muriatic acid ok to use as I have some already? If it is could you suggest amounts? Thanks again. You're right, I did misunderstand you and I wasn't aware of what you were actually describing as a test strip. You are not using a test strip, at all. You are using an industrial pH paper that is only intended to be used as a ballpark figure and not to test pool or spa water. That's why there was no agreement with the pool store. I suggest that you use pH reducer granules. If you insist on using muriatic acid, add no more that a few ounces at a time and retest with an appropriate spa tester: something like the LaMotte Insta-Test strips would be ideal. Remember, you can always add more -- you can't take out! I hope that I have been helpful and help set the record straight.